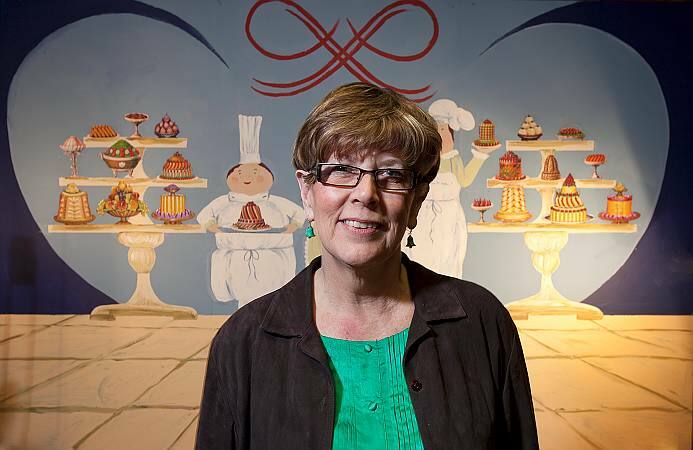 Living in a bed-sit in London in the Sixties, after arriving from South Africa, Prue Leith started out making lunches for directors' dining-rooms and ended up as one of the country's most successful businesswomen, running large catering companies and a teaching school, as well as serving on the boards of several major organisations. In addition, this remarkable woman (a rare combination of determination and radiant charm), ran a restaurant in Notting Hill, which was later awarded a Michelin star for excellence. Several people in the audience at Prue's captivating talk in Wootton on April 9th testified to its outstanding quality. Others had been on courses at Leith's School of Food and Wine and emerged far more proficient in the kitchen. At its height, Leith's Good Food Limited employed 500 staff and had a turnover of £15 million in the late Nineties, but the business was subsequently sold when Prue decided to take on new challanges, having written 12 cook-books. She enrolled on a creative writing course and has just published her fifth novel, A Serving of Scandal, the cover of which bears the Daily Mail's claim that Prue was born to write - just like she was born to cook. She recalled how her writing talents were developed and honed, taking advice from publishers on which characters to keep, which to remove and those to make more prominent. Research for her novels has also taken her to many fascinating places, including Chatsworth and Highgrove, where the head gardeners took Prue on guided-tours to display the wonderful fruits of their work. Earlier, Prue had begun her journalistic career on the Daily Mail when she offered readers recipes, which were religiously followed. During the worst days of the IRA terrorist threat, Prue received a suspicious package, which felt like it was full of wires and so she sent it straight to a special area to be dealt with. After careful exaination, it turned out that the "wiring" was, in fact, some dentures buried in a piece of particularly sticky food which had resulted from a reader not following properly one of Prue's recipes. Amazingly, Prue recently celebrated her 70th birhday and her work-load is still considerable, including recent appearances as one of the judges on The Great British Menu on BBC Two - a recording of which was transmitted just half an hour before appearing in Wootton. Total proceeds from the evening were £667, including a record £107 profit on the wine (thanks to Mimi Shepherd and Simon Heighes), plus a share of the sales of Prue's novels, which she signed after her talk. So far, after sixteen talks, we have raised just over £9,000. The TalksTeam has been awarded a further grant of £1,000 from the Daisy Field Charitable Trust, in addiiton to the £2,500 from the Oxfordshire Community Foundation. The first phase of work will centre on improving the toilets before the electrics in the hall are upgraded.